Lewis Hamilton may have missed his chance in Austin, but the Mercedes driver only needs to finish seventh at the Mexican Grand Prix to be crowned Formula One champion. Victory at the Circuit of the Americas would have made Hamilton a five-time champion after rival Sebastian Vettel could only finish fourth. However, Hamilton had to settle for third on Sunday as Kimi Raikkonen and Max Verstappen both finished ahead of him. Hamilton had led the race with 19 laps to go but the soft-tyre compound let him down and he was forced to pit for a second time, handing his rivals the chance to go through. Despite that disappointment, moving level with the great Juan Manuel Fangio could come as soon as next Sunday when F1 rolls into Mexico City. Vettel has to win at the Autodromo Hermanos Rodriguez, but his dreams will be ended if Hamilton can finish inside the top seven. 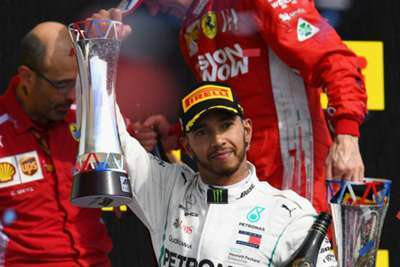 Should the German fail to claim the top spot on the podium, Hamilton's advantage at the top of the standings will be unsurpassable no matter where he finishes.